In the early 1900s the general view of stars was that they contained about the same ratio of elements as Earth. That is, they were made largely of things like iron, silicon, oxygen and the like, and not much in the way of hydrogen and helium. That’s in direct contradiction with what we know today, but it was a reasonable assumption at the time. At that point there was no understanding of nuclear fusion and the generation of elements, and a safe assumption was that the distribution of elements was fairly even across the solar system. There was evidence to support this idea as well. By observing the spectrum of the Sun, astronomers were able to identify certain elements such as carbon, oxygen and iron, so we know the Sun contained the same type of elements as Earth. Determining the ratio of elements, however, was a different story. 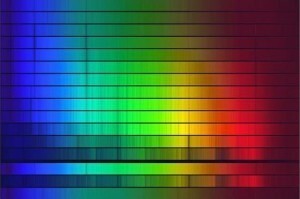 It was thought that the darker the elemental absorption lines in the solar spectrum, the more of that particular element there must be. But the results were inconsistent, so it was difficult to pin down clear ratios. Enter Cecilia Payne-Gaposchkin. In the 1920s she was a graduate student of Harlow Shapley (famous for determining the shape of the Milky Way). Her dissertation focused on solar spectra, and she was able to demonstrate that the strength of an absorption line didn’t just depend on the amount of an element, but also on the ionization of the element (which depended upon a material’s temperature). From this she was able to prove that the ratios of silicon and carbon were similar to the ratios found on Earth. But she also found that the Sun contained massive amounts of Hydrogen. Her calculated levels were about a million times higher than expected. This is the type of result that makes you question your abilities, but Payne confirmed her work and clearly showed high levels of hydrogen. Payne successfully defended her dissertation, but the result was controversial. Some astronomers such as Henry Russell actively opposed the idea. But Payne’s results were right, and later evidence confirmed her results. It was one of the first steps toward our modern understanding of the Sun and other stars.